Over the last few months we have been putting together a new website ready for today's public announcement of Wales' top 50 fastest growing companies. The Fastgrowth 50 recognises and awards those companies that show exceptional growth sustained over a period of time and after thirteen years of identifying the fastest growing firms in Wales, the unique initiative is firmly established as the list of business success that entrepreneurs across Wales aspire to. Organiser Professor Dylan Jones Evans explains: "Every year, it is a constant remainder of the vast entrepreneurial potential that exists within the Welsh business sector, with growth performance by businesses that is as good as any to be found across the regions of the UK." 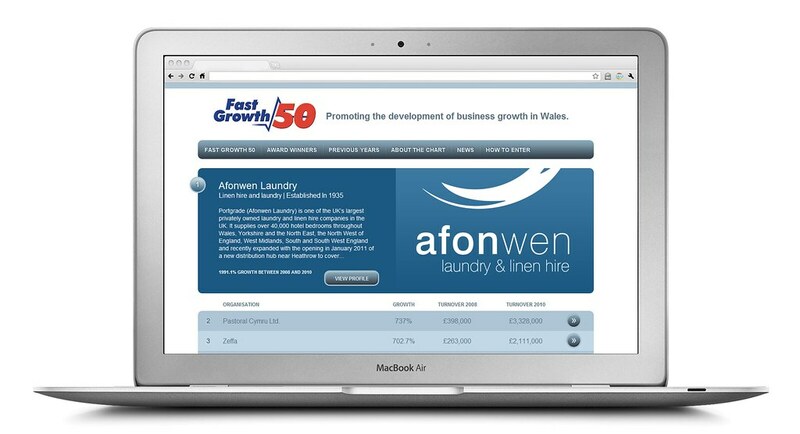 Hoffi's role was to inject life into the online presence of the Fastgrowth 50. Working closely with Dylan we developed a prominent chart based focus to the site, which showcases this years winners and features Avonwen Landry as Wales' number one fastest growing company for 2011. Additional features such as news publishing and profile management will come on board (for those on the list) over the coming weeks, allowing this year's fifty to take ownership of their listings, whilst being able to use the website for promotion throughout the year. This years event was supported by Capita Law, Santander, Media Wales, Logicalis, Venture Wales, University of Wales, Sinclair Group and University of Wales, Newport.